There are many family bonding activities that can help build closeness among family members without requiring much time or preparation. Bonding as a family can be quick and simple, and most of the time, not require anyone to even leave home. Have a weekly family movie night at home. You can rent a movie or choose one from your home collection. Ask each person what movie they would like to see and give each person a chance to choose one of their favorites. To complement your movie night, serve popcorn and candy to make it feel as if you are at the movies. Volunteering together not only strengthens the family bond, but can also demonstrate the importance of giving back to the community. Some volunteer ideas that are ideal for families are serving meals at a shelter, picking a family to help during the holidays through Angel Tree or a similar project, or participating in a charity walk. Baking cookies is a fun kitchen project that can bring everyone in the family together. Making the cookies can be as fun as eating them. During the holiday season, allow kids to decorate festive cookies and share them as gifts. Sitting down to a dinner is a great way to connect with each other and share the details of your day. You can cook together to increase the bonding time or make it as simple as ordering a pizza and enjoying it together. Take the family on a traditional picnic with all the trimmings. Let everyone pack one of their favorite foods. While picnics are common in the summer, you may want to plan a winter picnic for something new and different! 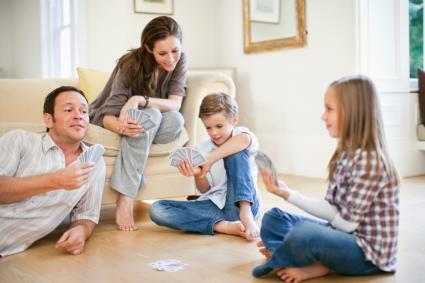 Board games can bring tons of laughter and fun to your family bonding time. Game night can bring out the inner child in everyone. Some board games to consider playing are Monopoly, Pictionary and Trivia Pursuit. Create a family game collection and take turns picking out a game to play. Games that can played on the Wii or Play Station are other options to consider. Also consider going outdoors and playing a game such as basketball or catch. Exercise can be a part of family fun and offers everyone benefits. Getting outside and enjoying the fresh air can be a great stress reliever as well as a fun way to get everyone together to talk and enjoy the scenery. You can take a walk around your neighborhood or go to a local park or hiking trail. Family camping for one night can take place right in your own backyard. For this family night activity you'll want to buy or borrow a tent or sleeping bags, as well as items like bug repellent and a flashlight. Keep it simple and plan to cook hotdogs and marshmallows over a hot grill or fire pit (if zoning allows) on a long skewer. Once inside the tent for the night, become a storyteller or sing songs together. If your kids are older, planning a walk at sunset is a fun way to spend time together. If possible, choose an elevated location from which you can see the sun's descent, or for the ultimate sunset experience, opt for a west-coast beach. Bird watching is an ideal way to get the whole family outdoors and involved. Buy a field journal to help identify birds and keep a family log of all the birds you spot or take or draw pictures and start a family bird-watching scrapbook complete with images. Have a family night out and go to a movie, concert, or play. Get each person to come up with a list of fun night out activities and compile a list. Choose a different activity each week or month. Pick a book that everyone is interested in. Books such as Harry Potter, Twilight or a special holiday story are all great choices. Have each person take turns reading aloud, then discuss the book after it is over. Arts and crafts can be fun for kids and adults. There are many craft projects that are simple, yet can still be a great way to bring everyone together. For example, during Christmas have each person make an ornament to hang on the tree. Begin a family tree based on the information you have on hand. Ask the older kids to do some online research about the family history or write to long-lost relatives to fill in the branches of the tree. Discuss the geographic and ethnic origins of the family and how they have influenced present day practices, beliefs and celebrations. Start a family journal. Designate one night a week to make a new entry and take turns on who gets to write the information, letting her add her personal observations to the events of the past week and comment on people and places. If a relative from the past has left behind a diary or journal, pass it around, read it aloud and discuss the events and people that shaped the writer's life. How Stuff Works: In addition to a list of family-bonding activities, expect to find craft activities, games, party ideas and more. Disney Family: This site features family-friendly recipes, craft projects, printables, holiday ideas as well as ideas for vacations and more. Hasbro Games: Browse this site to find everything you will need to make your family game night a hit. From game recommendations to recipes, get ideas to incorporate into your family's game night. To make the most of your family time, make sure that everyone is enjoying the activity at hand. There are many activities to choose from, so pick the ones that appeal to your family and their specific interests.